In this sense, Rupestrian occurs at the meeting point of nature and history. In such instances, it is not only as if civilization and abandonment occurred in successive waves over the centuries; rather one was the pre-condition of the other. A natural site transformed into a “work” through human intervention is, in turn, retrieved by nature, which makes a “work” out of what remains of the initial human intervention. For me it is not so much about working horizontally in space (e.g. Land Art) as engaging vertically with time, which serves as a medium in a process of stratification ― a form of a ‘reverse archaeology’. 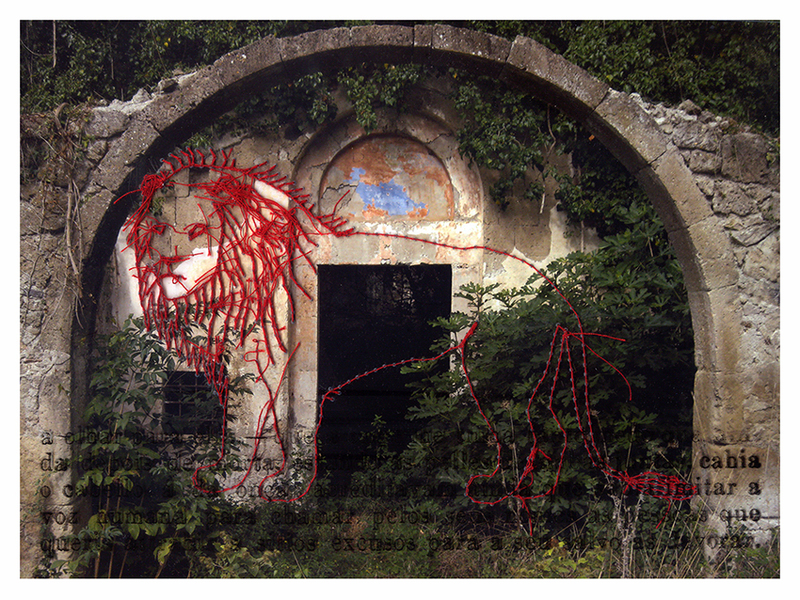 Several of these works present the silhouette of a wild animal, either sewed on the plastic or transferred on the glass. They are taken from a Portuguese popularization booklet, found in a flea market, and are meant to symbolize the inevitable return of the wilderness (if we take further our Enlightenment drive). If you hike in the Fiora valley, in the Latium region just South of Tuscany, and go up and down on banks collapsed after recent floods, and you enter woodlands tangled like jungles, you can reach a couple of romitori, or hermits places, which survived the centuries, thanks to their isolation and to the little interest they have aroused in succeeding generations. Here is Poggio Conte: past a waterfall that provided drinking water to the monks, you can see the remains of two tiny cells, to which lead arduous steps carved into the tufa, and a Cistercian-inspired rupestrian church. Its interior – in spite of the oculus carved into the facade – is completely dark: if you make photographs, it will be at random, and only the film development will reveal the surviving fragments of the paintings that decorated the vaults. You will discover that this hermit from end of XIII or beginning of XIV Century (perhaps a monk of French origin?) painted the walls with decorative motifs decisively prosaic, reminding more of an interior design than of an exercise of meditation or veneration. Nature is slowly retaking its rights; mosses and lichens cover lily flowers, red griffins and phallic shapes. Slowly fades away the work of the solitary men who spent years in shaping and covering with colors this dark cavern, being aware that very few people would ever look at them. 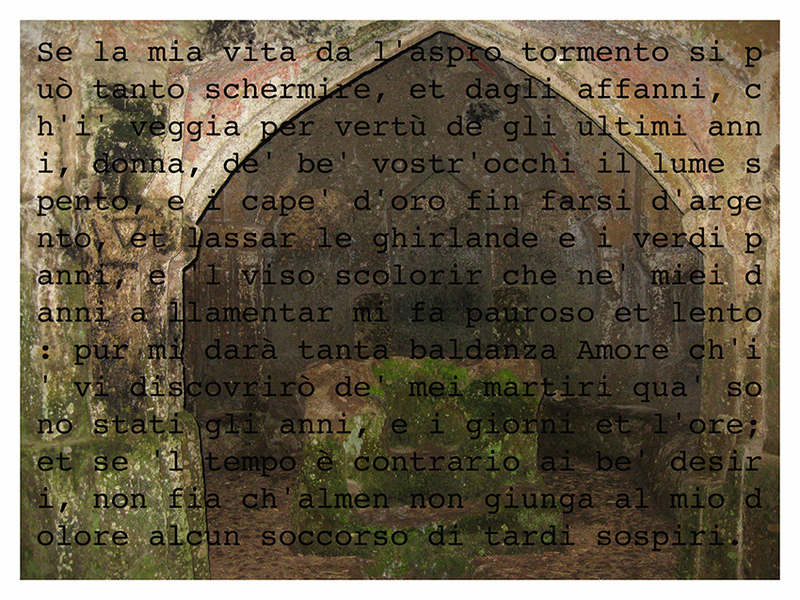 Over my intrusive flash photos I superimposed, as a weave backlit readable, a sonnet taken from the Canzoniere of Petrarch. It speaks, in beautiful metaphors, of priceless sufferings of love. I transcribed it in a continuum, like a telex. 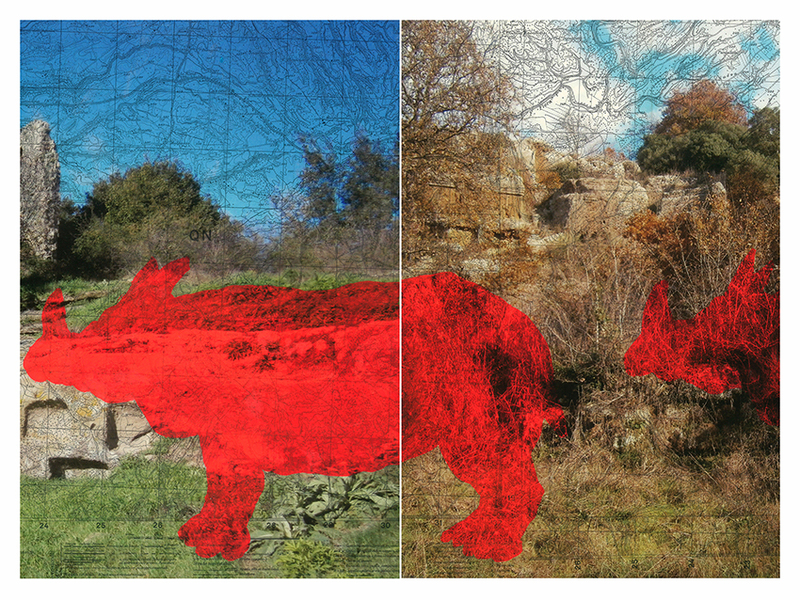 In recent years, whenever I could, I hiked around the Tuscia region, in a sparsely inhabited land full of prehistoric and archaeological sites, with a leaf, or a tongue, made out of latex dipped in red fluorescent pigment, leaving it on the ground, and then shooting it. The Etruscan tombs, which become medieval hermitages, then sheepfolds, then wartime shelters, finally lovers hideouts, are the usual stops of my wanderings. I decided to entitle this body of work “land paintings” partly as a reference to the notion of “picturesque” so dear to several land artists active in the 1960s and 1970, and in opposition to the modernist vision of a work of art seen as a unique, timeless experience, to be grasped in one single glance. The title is also meant to evoke the idea of stepping on earth, looking for hidden and forgotten places. 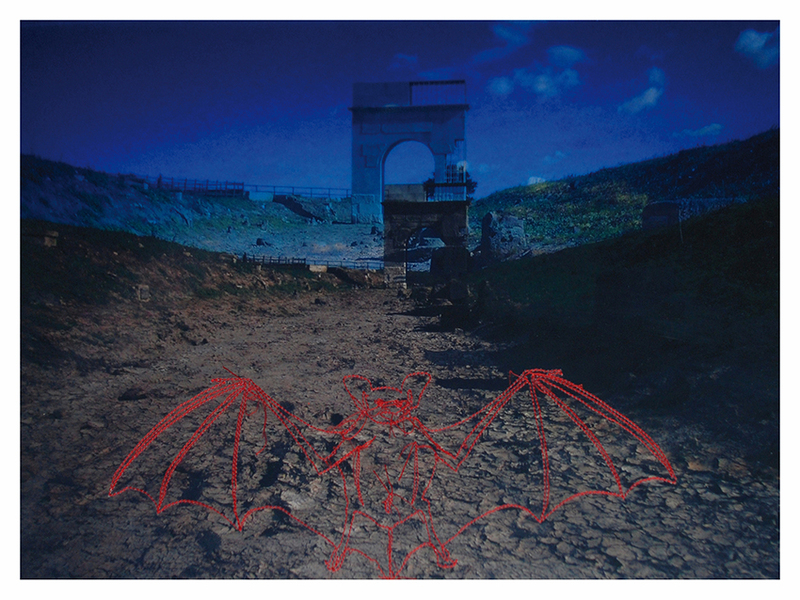 In my previous work, the sign placed on the photograph was a means of preventing the fruition of the image in its entirety, of opening up a gap of time within it, by using a fluorescent color that displaced the vision. This intrusive element is now a material one and becomes an artwork as soon as the photograph is taken. This is the reason I don’t usually add other semantic levels to it. 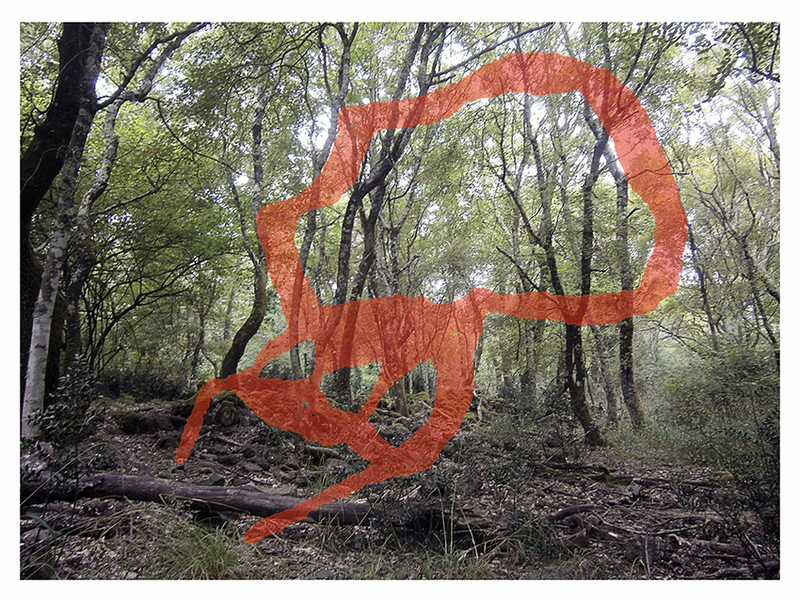 Also, in contrast to Land art, I don’t transform the site into which I introduce myself; I just leave a sign. This sign left on the sites before photographing them constitutes a marker of my “I have been there” but also a way of seizing the baton, in a relay race with the past. I would simply like to recall that, in Italian, the baton is called il testimone, “the witness”. Dante was certainly the last visitor to the Garden of Eden. No forest, not even the ancient forest that covered the volcanic formations of the Tuscia region in central Italy, can be considered primeval forest; even the conservation is an artificial fact. In the Selva del Lamone natural reserve, for instance, everywhere traces of human “civilization” can be found: dilapidated walls, the remains of road pavement, the furrows of the charcoal wagons, the heaps of stones that once constituted Etruscan walls, and today the strips of white and red paint on the network of trails. This is all but the nature depicted by Leopardi in his Operette morali, a powerful and cruel nature that, in its manifestations, doesn’t even bother to know what happens to mankind (Dialogo della natura e di un islandese, 1824). This is a today European natural “park”, where the primeval is doomed to be just reminiscence: trees, bushes, rocks covered by moss look at my eyes like Romantic Age fake ruins. My photographs taken in the Selva are reproduced on transparent layers and superimposed on reproductions and personal variations of prehistoric petroglyphs; those in Nevada date to ten thousand years ago and are the oldest discovered on the North American continent. They are the signs of an era when humankind was just beginning to appropriate nature. They are reproduced with red fluorescent acrylic paint, as a gesture of signage, the difference with the petroglyphs being only the technology of the reproduction. Here you find a variation on this same subject; I just emphasize the relation to the theme of ruins into nature. 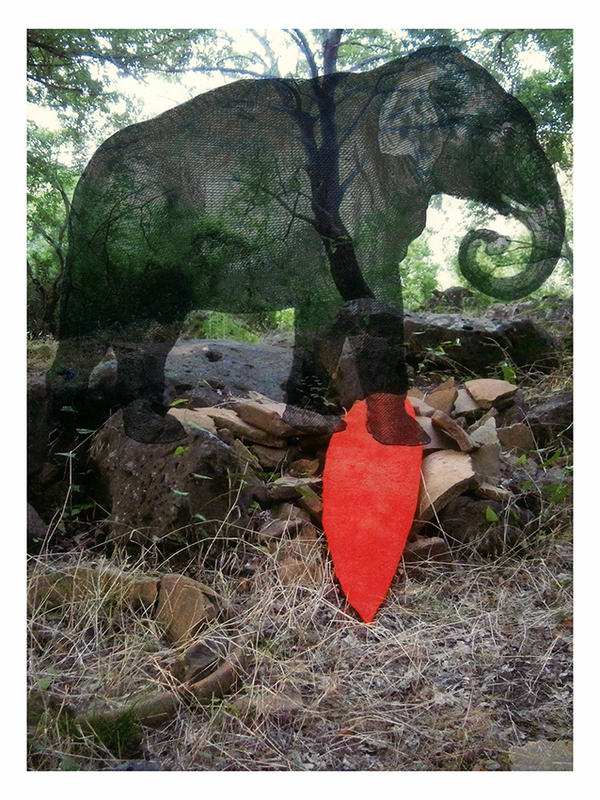 This series means for me an open and unresolved reflection on nature seen as a historical phenomenon. This entry was posted in ENGLISH TEXTS. Bookmark the permalink. Both comments and trackbacks are currently closed.